Adzuki beans (Chinese red beans) (アズキ) are the leguminous fruit-pods of a plant originally from Asia. The beans occupy a significant cultural importance in the oriental cuisine. The red-colored beans were believed to have the effect of suppessing negative emotions and bad luck. Binomially, red beans belongs to the Fabaceae family, in the genus: Vigna. Adzuki bean is an herbaceous annual. It has similar climate and soil requirements as soybeans. After about two months after seedling, the plant blooms yellow flowers which develop into elongated, cylindrical, smooth skinned pods in clusters in the next 40 days. Adzuki bean pods hold tiny seeds that are brownish red, but can also be black, light yellow, or gray. They can be plain or variegated and have a prominent white hilum (the ridge where the bean was connected to the pod). The boiled beans features nutty, buttery texture and sweet flavor. Adzuki beans are one of the important sources of plant proteins. They hold 338 calories and provide 19.87 g or 35% of recommended daily allowance of protein. 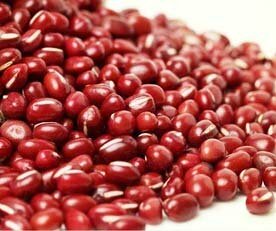 Red vigna beans contain antioxidants such as isoflavones and pro-anthocyanidins in ample amounts. Total value of isoflavones is 0.59 mg per 100 grams of beans; daidzein and genistein at levels 0.36 mg and 0.23 mg respectively. Isoflavones have been found to reduce post-menopausal cancers and osteoporosis. Like othe legumes, adzuki beans contain lots of dietary fiber. Dietary fiber works as a bulk laxative that helps to protect the colon mucosa by decreasing its exposure time to toxic substances as well as by binding to cancer-causing chemicals in the colon. Dietary fiber has also been shown to reduce blood cholesterol levels by decreasing reabsorption of cholesterol binding bile acids in the colon. Plant sterols (phytosterols) especially β-sitosterol that help lower cholesterol levels in the body. Fresh, as well as dry adzuki are one of the finest sources of folates. They carry more of this vitamin than lima, soy or fava beans. 100 g dry, mature beans provide 622 µg or 155% of folates. Folate, along with vitamin B-12, is one of the essential co-factor for DNA synthesis and cell division. Adequate folate in the diet around conception and during pregnancy may help prevent neural-tube defects in the newborn baby. Red beans indeed are very rich sources of many B-complex vitamins, particularly vitamin-B6 (pyridoxine), thiamin (vitamin B-1), pantothenic acid, riboflavin, and niacin. Most of these vitamins works as co-factors for the enzymes in carbohydrate, protein, and fat metabolism. In addition, adzuki compose wide range of minerals like for being low in calcium -6% of RDA to high levels such as 64% RDA of iron, 75% of manganese, 54% of phosphorus, 36% of manganese and 27% of potassium. Potassium is essential electrolyte of cell and body fluids. It helps counter pressing effects of sodium on heart and blood pressure. The human body uses manganese as as a co-factor for the important antioxidant enzyme, superoxide dismutase. In the markets, choose dried beans. Although their color pattern would not come in the way of quality, red beans ofetn preferred in the cooking In the US markets, dried beans in bulk bins, canned, sprouted adzuki available in the supermarkets all around the year. Young, green adzuki pods sold in the Chinese and Korean markets used much like green beans in cooking. While buying tender adzuki from the local vegetable markets, look for green, uniformly developed, immature, firm pods. Avoid overmature pods as the beans prime their age and converted their sugars into starch. Also avoid sunken, shriveled pods. At home, store dry beans in air-seal plastic/metallic bin in a cool, dry place away from high temperatures and high humidity. Young tender pods, however, treated like edamame or green beans for storage. Store them in a perforated plastic bag and place in the refrigerator set at high relative humidity. They stay well for up to a 4-6 dys. To enjoy, however, use them soon after the purchase. Dry adzuki beans most sought after in the Japan cuisine only after to soybeans. Boiled beans exhibit rich red color and delicately nutty, sweet flavor. Cooking often requires soaking in cold water for 2-3 hours. The beans can also be boiled simmer for 1.5 to 2 hours. Or Pressure cooked with soaking for 20 minutes and without soaking for 20-30 minutes. Soaking and boiling also helps eliminate anti-nutritional compounds in the red beans. To prepare, wash fresh green azuki pods in cold running water. To shell, snap the calyx end towards midrib and pull all along the suture line as you do for other beans pods. Split open and remove beans. Immature adzuki bean pods are used in the same way as green beans and generally treated like vegetables. Dry beans employed in a wide range of dishes boiled, sprouted, popped, mashed (paste). The beans are added in soups, stews mixed with other complementing vegetables like kale, carrots, mushrooms, etc. Sekihan (赤飯) is the traditional Japanese sticky rice and adzuki beans dish prepared for special occassions such as shichi-go-san. Boiled adzuki beans prepared into different styles of paste (an or anko) for use in both savory and sweet dishes. Koshian is the most common type in which boiled beans sieved to remove bean skins. Tsubushian is where the beans are mashed after boiling and bean skins are a part of the paste. Known as red choti dal in India, the beans used in variuos kinds of savory stews to be eaten with unleavened flat bread (chapati), and rice. <<-Also read Lima beans nutrition facts and health benefits. <<-Also read fava beans nutrition facts and health benefits. <<-Back to Legumes from Adzuki Beans. Visit here for an impressive list of vegetables with complete illustrations of their nutrition facts and health benefits.